SocioON endeavors to provide a very ethical and progressive social portal therefor it has devised its own set of community standards/user ethics guidelines, these guidelines provide an understanding regarding that what type of content maybe share on SocioON and what type of content may be used by the user and may be removed by the SocioON in its own discretion, please note that if any content(text, software, scripts, graphics, music, sounds, videos, photos, indirect features other materials and data field services) is not in accord with your feelings and understandings it does not mean that it is not in conformity with SocioON user ethics guidelines. Third party liability: SocioON is not liable for the material content policies practices of the third party website. Any use of the third party website by the user/accesses/browser by or through SocioON shall not make SocioON liable in any manner. Further nothing in these terms and condition deems to confer any third party rights or benefits. SocioOn is a social-economic platform where the user can earn along with socializing. We provide a variety of timelines including Social, Page(s), Group(s), Political, Opinion, VideoOn, and NewsOn. The user must purchase promotion from SocioOn if the user wants to make a Public post on any specific timeline. In return, Socion gives the user a Public post limit. SocioOn is a Technology for human development (THD). We believe that a user’s Post/Content is User’s product for which we provide 4 content appreciation buttons to all users that include “Repost”, Feed, Great Job and CoC. If user content is learnable and worthy enough to the public, the public can feed his post and can give any action to this post. SocioOn gives responsibility to its users to provide clean, learning and thoughtful ideas through their content. While doing this, the public can give User appreciation through Great Job, COC, Repost and Feed buttons. Socion takes 20% service charges from the promotional budget and 80% gives back to socioon users. The user can share his worthy content to other social media or can viral his post with his own social circle. The user can also earn through sharing, liking and commenting. In this way, a nonstop able tree starts growing with a mutual benefit to the post owner and to all connected users. Actually, the concept is the same as like other social media except Socion gives 80% of revenue to its Users, however, other media does not share its revenue with users. Our user works on the promoted post and keeps on sharing the content to SocioOn and other social media circle. Doing so User earns from the promoter of the post. This is the unique idea of Founder of SocioOn and that can never match with any other platform. The promoter of the post also gets appreciation benefit through a great job, COC and reposting of his post. Our promoter gives money to our users in order to viral his post to his social circle. In this way, the user does not just waste his time on social media but also earn through socializing which is indeed very much helpful for jobless people sitting at home. Disable your great job button. Disable your post advert revenue, Disable all your earnings. Maybe your account will be blocked forever. All earnings can be and will revert back to the posts. *All these policies are also applicable to iON messenger. HATE SPEECH(prejudice/bias relation to faith, cast, color, nationality, ethnic origin, gender, age, disability, special needs, blasphemous, abusive content And like nature content whether relating to natural person(living or dead) artificial person, bullying /harassment, criminal intimidation/threats of like nature. OFFENCES (fascination, an invitation to crimes/ offenses and like nature activity) INCLUDING BUT NOT LIMITED TO proscribed and prescribed organizations, terrorism or to exploit someone for terrorism activates. we Hope that the above mentioned has have clarified things for you and if there is something that you aren't sure whether you need or not it's usually safer to leave cookies enabled in case it does interact with one of the features you use on our site. However if you more information and guidance you may contact us through one of our preferred contact methods. SocioON welcome links to its website SocioON made in accordance with the terms of this hyperlink policy. This Hyperlink policy objects to assist you when you link to our website SocioON you by using our website have agreed to be bound by the terms of this policy. No link pointing to our website shell be misleading The appropriate link shall always be used in the links pointing to SocioON SocioON From time to time may update the URL structure of SocioON express written authorization is granted by SocioON all links shall point to [URL(s)]………….. SocioON logo link shall not be used for linking to SocioON without an express written authorization of SocioON. No inline linking technic shall be used for linking to SocioON. No SocioON contents shall be framed or any like technology relating to the content of SocioON shall be used. SocioON includes hyperlinks to other websites owned and operated by third parties; SocioON does not recommend in any manner such hyperlinks. SocioON has no control over the contents of third party websites. SocioON does not accept any responsibility for the contents of the third party website. SocioON does not accept any responsibility for any loss or damage that may arise your use of contents of third party website. You agree that should SocioON request the deletion of a link from SocioON which under your control, you will delete immediately Where you would request to remove a link to your website that is included on SocioON, please contact SocioON using the following contact details. However, SocioON has got the sole discretion to remove or refuse any request for removal of such links. SocioON may amend this hyperlink policy at the time by publishing a new version of hyperlink policy on SocioON.you are bound to take notice/read this hyperlink policy as soon as it is published on SocioON.you by using SocioON hyperlink policy HAVE AGREED WITH IT, therefore, please read the policy before using SocioON. If in case you do not agree with SocioON hyperlink policy do not use SocioON. Electronic spamming is the use of electronic messaging systems to send unsolicited, bulk or indiscriminate messages (spam), especially advertising/commercial purposes, as well as sending messages repeatedly on the same site. While the most widely recognized form of spam is email spam, the term is applied to similar abuses in other media. SocioON hereby declares its zero tolerance for spam. SocioON messaging systems automatically scan all incoming email and other messages and filter out messages which appear likely to be spam. Where SocioON reports the incoming email as spam the relevant i.p addresses and domain name may be got blacklisted. It is to be noted that no spam filter system is absolutely accurate however SocioON spam filter system shall from time to time filter messages likely to be spam. Where you believe that you have sent a legitimate message and SocioON spam filtering system has filtered such message you may advise such message to the required recipient through other means. SocioON provides a facility that enables users to send email messages / private messages / any other type of messages to others. Users must not use SocioON messaging facility or any of SocioON other services to store, copy, send, and relay or distribute spam. SocioON has got the discretion to modify this anti-spam policy any time by publishing a new version of the anti-spam policy on SocioON you are bound to read this anti-spam policy before using SocioON if you don’t agree with this anti-spam policy please do not use SocioON. This website is owned and operated by Iqbal Akhtar Hussain. SocioON’s principal place of business is at SocioON principal place of business/Head Office is at rm18b 27/f hk king comm ctr -16 fayuen st mongkok kl, rm18b 27/f Hong Kong and has sub-offices regarding country domains in more than 40 countries of the world. .
You cannot use the following without the prior approval (written, online registration etc.) of SocioON. You cannot link SocioON on your own website or any third party website without the express approval of SocioON.it is immaterial that such linking is to be used for commercial, non-commercial, non-profit making purposes). For third violation account of the user, shall be deleted. For any subsequent violation, the user himself shell be blacklisted and shall never be allowed again to use SocioON. In addition to all the terms and conditions policies notices statements of SocioON the following advertisement policy is subject to the former. This policy applies to all advertisement including but not limited to videos. This advertisement policy is subject to additional agreements terms and guidelines for advertisement on SocioON, if any. Users and advertiser are liable to understand and comply with all the with this advertisement policy and terms and condition policies notices of SocioON in case of failure to comply with advertisement policy and terms and condition policies notice statements the accounts or advertisements may be suspended/terminated, canceled or removed. Whether any user advertiser could present ads to SocioON for third parties? And whether in such a case prior written approval is required by SocioON? Following guidelines are broad and not exhaustive. Users or advertiser must use common sense and be mindful of the location customs laws where such advertisements are to be reviewed. SocioON has got the exclusive right to refuse or reject any add which in its opinion negatively effects SocioON or its relations or interests relating to third parties. Claims, promotions, schemes, offer business practices which the advertiser or user has no intention to fulfill, satisfy or comply with. Movie or Movies trailers (except the express written approval of SocioON ). Whether as reported on SocioON could be linked to the user’s website or third-party websites? Whether an ad could contain leading questions? If you have any questions about this advertisement policy please feel free to contact us as follows the Advertisement department via email Email: help@SocioON Intellectual Property Policy Question: In which year socioon Was copyrighted? SocioON has got the trademark, trade name, copyright and of SocioON and the material on of SocioON including but without limitation (logo, text, computer code, artwork, music, audio material, video material and audio-visual material, Photographs, images and are owned SocioON. SocioON grants to you a worldwide non-exclusive royalty-free revocable license to view this website and the material on this website on a computer or mobile device via a web browser and to copy and store this website and the material on this website in your web browser cache memory; and to print pages from this website for your own personal and non-commercial use. However no one shell broadcast, rebroadcast or show or play, adapt, edit, change, transform, publish, republish, distribute, redistribute, in public this website or the material on this website in any form or media without SocioON prior written permission, no one is allowed to conduct data mining of SocioON through any automated system or otherwise. If you want to use copyrighted materials you have to obtain express written permission from SocioON. In case if anyone contravenes or violates this intellectual property policy socioOn.com or any material on the website contravenes, infringes or violate any other intellectual property rights then SocioON has got all the legal and equitable rights to satisfy itself including legal cast. Information provided by SocioON relating legal matters is not legal advice and must not presume so if you have any question relating to legal information provided in SocioON please see legal advice from a professional attorney at law/lawyer/advocate. SocioON does not make warranties express or implied relating to the information provided on legal matters. SocioON does not warrant that the legal information provided on SocioON is complete/up-to-date/accurate. SocioON shall not be liable for any direction indirect incidental, special consequential or punitive damages of any kind resulting from the use or inability to use SocioON services or any business transaction enter through SocioON shall have no direct consequential special indirect exemplary punitive or other liability whethe, in contract tort equity, law or under any other legal theory/under the terms and conditions policies notices provided by SocioON, Our aggregate liability shall not extend beyond the 50 dollars. In case if you have any dispute with SocioON’s officers' directors employs shareholders licenser licensee assign successor, SocioON shell not be responsible/liable for any consequences (legal or otherwise) of such dispute. SocioON’s inability to enforce the terms, conditions, policies notices (with or without modification) provided on SocioON shall not amount to in any manner waiver or release of the same. 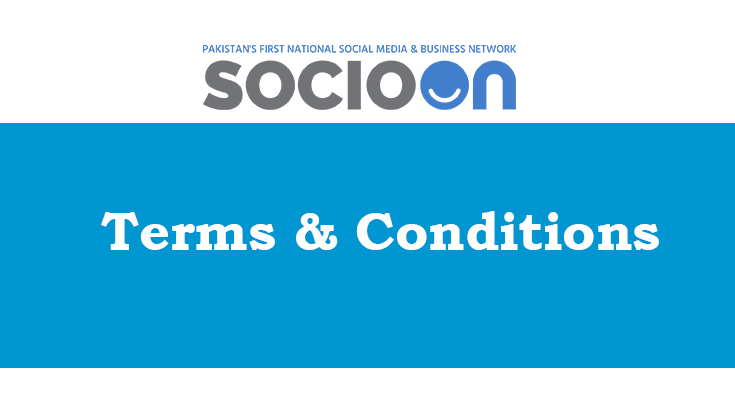 In case because of your breach/infringement/violations of the terms conditions policies notices (with or without modification) provided in SocioON, SocioON or any third party suffers or is exposed to any sought of damage or injury you are liable to indemnify the SocioON and any such third party. In case you reach a settlement (in court or out of court) with any such third party you shell not finalise the settlement without obtaining prior written approval of the SocioON for such settlement, in case you suffer or exposed to any damage/lose due to any third party SocioON will not be liable for any loss damage/lose. If you breach infringe violate or fail to comply with any terms and conditions policies notices which you have consented with SocioON, any licenses (if granted shall terminate automatically without notice from SocioON. upon any termination or notice of any discontinuance, you shall immediately stop using SocioON. All of the rights and obligations under these conditions and terms policies notice statements are freely assignable by SocioON for the purpose of merger, accusation, and sale or by operation of law or otherwise. SocioON does not guarantee that SocioON is always be safe secure error-free bug free virus free trogon free horse free worm free or free from the like which may be transmitted to or through the website by any third party free any errors or omission in any content (Including posted email, communicated transmitted or made available through the SocioON or will always function without disruptions delays or imperfections. SocioON shall not be liable for any information opinion or advice received through or advertised in connection with the SocioON o for any links provided on SocioON, SocioON shall not be liable for any defamatory offensive or illegal conduct of any user or third party. If you do not agree with this legal disclaimer do not use SocioON. All advertisement purchasing/purchasing of promotions are final. All services are sold “as is.” You assume the responsibility for your purchase, and no refunds will be issued. If the user wants to promote his post publically on SocioOn, User purchase “Promotion” from SocioOn that starts from $10. SocioOn gives the user a public post limit after receiving of his promotional amount through Skrill, Easy Paisa and Jazz Cash. User promotes 1 public post for $1 that the user has purchased from SocioOn. If any organization purchase $10 package then they can get 10 public post limit. SocioOn takes 20% service charges and 80% is added to the post. This 80% revenue is then given to the users doing commenting, sharing and liking this post. The user can redeem through mobile recharge or receive cash through easy paisa, Mobicash or Skrill. Also, can purchase public post promotion or any of our products in SocioOn. Do users need to do to Earn revenue? SocioOn is free like other Social Media and other business networks. However, SocioOn also provides promotions to its users. If user purchase promotion of $10 then users can start earning. Users can earn from the promoted post by liking, commenting, sharing. The promoter can earn through 4 appreciation buttons including great job, COC, Repost, Feed. Actually, if the creator of the post has made an extraordinary good post then that is his very own product. After he can advertise his product/ article/video/image and then promote a post for $1. The user can get appreciation from the public through a great job, COC, Repost and Feed. People help the creator of the post to create more and more content for the public.